The Nautilus R616 Recumbent Bike MY18 2018 retains all the high-end features of the previous 2014 model, but with a new intuitive console that’s now even more user-friendly. The Nautilus R616 Recumbent Bike MY18 is ergonomically designed to give you a comfortable workout and packed with features to keep you motivated and progressively challenged to help you reach and maintain your fitness goals. 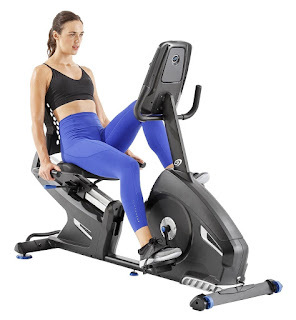 The Nautilus R616 Recumbent Bike 2018 combines a high-speed high-inertia perimeter-weighted flywheel with an ECB resistance system to ensure smooth and quiet operation throughout the wide range of 29 programs and 25 resistance levels. 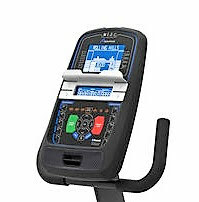 The Nautilus R616’s wide range of workout programs include profile, heart-rate, custom, fitness test, and Quick Start. The Nautilus R616 2018’s console features a Dual Track (2 screens) blue backlit LCD displays and shows up to 13 workout stats to keep you motivated as you exercise including time, speed, distance, calories and heart-rate. To help you stay within your target heart-rate zone as you exercise, the Nautilus R616 offers both contact-pulse and telemetry (compatible with wireless chest-strap) heart-rate monitoring. The Nautilus R616 Recumbent Bike MY18 allows for up to 4 user profiles and also offers Bluetooth connectivity, enabling you to seamlessly transfer your workout data to online fitness tracking apps such as Nautilus Connect and MyFitnessPal. The Nautilus R616’s console features a sound system with acoustic chambered speakers and MP3 input so you can listen to your favorite music as you exercise. Alternatively you can place a book, tablet or mobile phone on the built-in media shelf to keep entertained as you workout and watch the time fly by! There’s also a handy USB port to charge up your mobile or tablet. The Nautilus R616 Recumbent Bike’s console also features an adjustable 3-speed fan to help keep you cool as you cycle and there’s a convenient water bottle holder located at the side of the seat so you can keep hydrated as you exercise. The Nautilus R616 Recumbent Bike MY18 is designed with a low step-through frame design to make it easy to mount and dismount the seat. The bike’s sliding seat rail system makes it easy to adjust the height/distance of the seat to the pedals for a custom fit. The seat itself features a comfortable padded contoured base and a ventilated backrest to help with airflow. The Nautilus R616 Recumbent Exercise Bike 2018 is sturdily built and features over-sized crossbar tubing, center-support and integrated levellers for added stability. This recumbent bike allows for a maximum user weight capacity of up to 300 lbs. For easy relocation, the Nautilus R616 features front-mounted transport wheels and rear handle. The Nautilus R616 Recumbent Bike MY18 2018 is an impressive exercise bike for the money. It’s well-built and packed with high-end features typically found on bikes in the more expensive categories. This recumbent bike offers plenty of variety to keep you motivated and its ergonomic design allows you to workout for longer in comfort. Recumbent bikes in general offer a more laid-back cycling experience compared to traditional upright exercise bikes. They sit lower to the ground compared to an upright bike which makes them easy to get on and off, and the pedals sit in front of you rather than below you for a more stretched out feel. The large seat on recumbent bikes are much more comfy than a traditional upright bike and their backrest provides welcome support to your lower back. Recumbent bikes are low-impact on your joints while still providing a very effective workout and are particularly recommended for people new to exercise or people who are recovering from injury but have been advised to workout in a low-impact way. It’s easy to see why recumbent bikes are one of the easiest forms of exercise to stick with in the long term to reach your fitness goals!